Blueberry stem gall wasp has become more common in some Michigan blueberry fields, and Michigan State University researchers have been working to find effective management approaches for this pest. With emergence of the wasps starting over the next week or two during blueberry bloom, it is a good time to review what tactics can provide suppression of this pest. A gall that was formed last season showing multiple emergence holes, with a newly emerged gall wasp perched on the left of the gall. Photo: Rufus Isaacs, MSU. The main varieties affected are Jersey and Liberty, though there are low levels of galls showing up on some other cultivars such as Bluejay. Focus control efforts on fields with galls, but also keep monitoring through your farm to see if other fields are infected. Planting resistant cultivars in new fields and pruning galls out of infected fields in the winter are both important approaches to managing this pest, but for growers that already have many galls in their fields, a chemical control approach can also help reduce the infestation. 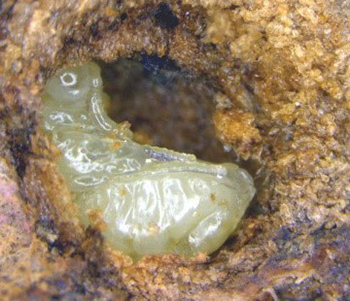 It is important to consider the timing of activity of this pest too, so in this article we discuss the timing of emergence and chemical control options. Gall wasps are expected to start emergence this week in southwest and west-central Michigan during the warm weather. The recent rainfall is also likely to have helped emergence because the galls become softer after rain. This new flush of wasps will be active through bloom while bees are still active, and protecting bees should be a priority of all blueberry growers since pollination is so important for your crop yields. The MSU Enviroweather system contains a degree-day model for gall wasp that predicts first emergence, which typically starts as Jersey bushes are coming into bloom. We are improving this model continually to ensure its accuracy, and for 2018 it predicts emergence in South Haven, Michigan, starting on May 20 (a site close to Lake Michigan), Fennville and West Olive, Michigan, on May 19, and Shelby, Michigan (Oceana County), after May 22. So this year it seems emergence will be starting over the weekend and early next week. Taking the time to check your fields is the best way to see if wasp emergence from galls has started in your farm (small round holes on last years’ galls are the tell-tale sign), and if it is continuing as it usually takes a week or two for all the wasps to emerge. The females can start laying eggs into blueberry shoots very soon after emergence, so protecting susceptible cultivars is another area of our research activities for this summer. Recent research trials at MSU and commercial farms indicate there are four key components to reducing gall density and size through the chemical control approach. First, if blueberry fields are infested with gall wasp, there are only a few options that can be used during bloom due to the need to protect bee’s health. Laboratory trials have shown good adult knockdown and some residual action with Sivanto Prime, a new butenolide insecticide that received a 2ee label for suppression of gall wasp. The label allows for two applications of 14 ounces each, which must be made seven days or more apart. This product has low toxicity to honey bees, but we still recommend application early in the morning, prior to honey bee foraging to reduce exposure, and do not tank-mix with azole fungicides. This early morning spray will also target BSGW with fresh residues as they become activity with increasing temperature and daylight, following a night of dormancy. Trials from last year indicate that an application of Sivanto Prime just before bloom or at early bloom (close to when gall wasp starts emergence) leads to a measurable reduction in galls. Still, the level of reduction was only about 25 percent compared to an untreated area. An additional potential option during bloom is BioCeres, which is a mix of Beauveria bassiana and diatomaceous earth. Some growers reported activity of this in 2017, but we have not conducted trials to evaluate its efficacy. MSU will be testing this product in 2018 research trials. It should be noted that this material is very sensitive to high temperatures and should be refrigerated until use. Second, after bloom the options for chemical control expand once the honey bees have been removed from the field. The carbamate Lannate and the pyrethroid Mustang Maxx have had the most repeated testing against this pest because we have seen a program with these insecticides reduce infestation at multiple farms. Additional pyrethroids Asana and Brigade have also shown activity against gall wasp in laboratory, research station and grower trials. Brigade is less sensitive to high temperatures and so this would be a pyrethroid option to consider if post-bloom temperatures are high. The organophosphates Imidan or Diazinon can also be used after bloom against this pest. Finally, the diamide insecticide Exirel has shown activity on gall wasp. The insecticides mentioned here all have efficacy against cherry and cranberry fruitworms, so these timings will help control those pests too. For gall wasp control, it is important that the first post-bloom spray is made at petal fall, immediately after the honey bee colonies are removed from the fields. The products listed above for the post-bloom timing are toxic to bees, so wait until the bee hives have been removed from the area. Remember that honey bees forage over many miles, so make sure these insecticides do not drift onto nearby fields that might still be in bloom. Third, if you are managing a highly infested field, retreating within seven days of the first application will be important to cover the span of gall wasp pest activity. Walk the fields and see whether wasps are still active and if there are galls starting to develop (reddish swellings on the new growth). Applications at this timing have been able to stop these galls from growing, indicating they are killing the wasp eggs and young larvae before they can fully form a gall. Previous trials have found Lannate, Brigade, Asana and Exirel all to be effective at this timing. Fourth (but still important! ), ensure the spray gets to the pest, because gall wasp lays its eggs into the young shoots, and so it is important the insecticide penetrate the plant tissues. Use a penetrant adjuvant such as a light summer oil or other product to help improve control. A low rate (0.25 percent by volume, or 1 quart per 100 gallons) should be sufficient to have the desired effect. Another important aspect is using higher water gallonage than usual. In all our gall wasp trials on farms, we see smaller galls and fewer galls when growers use more than 50 gallons per acre. The post-bloom timing lines up well with timing for cranberry and cherry fruitworm control, and each of the insecticides mentioned above are effective on fruitworms in addition to gall wasp. The selective insecticides Intrepid, Confirm and B.t., which are used during bloom to control fruitworms, will have no effect on gall wasp. Controlling gall wasp effectively will be a multi-year effort as none of the treatments we have tested have shown 100 percent control under field conditions. As MSU research develops more insights into how to prevent this pest, we will alert growers through the MSU Extension programs. Developing blueberry stem gall wasp turn from light to dark as they approach emergence. 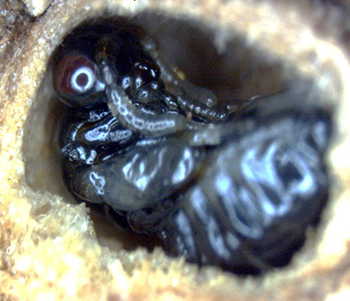 The lighter color (left) indicates emergence is not yet likely, while a darker color and red eyes (right) indicates emergence is close and bushes should be inspected frequently to identify when wasps emerge. Photos: Philip Fanning, MSU.